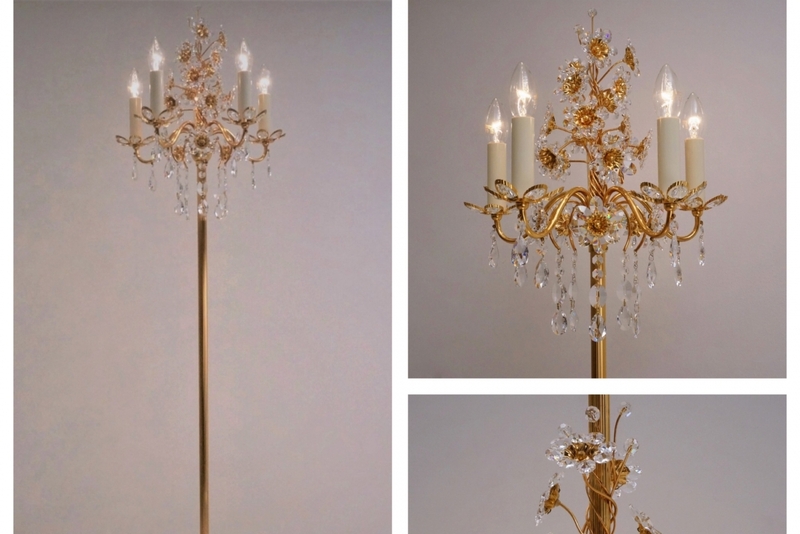 Palwa floor lamp, gilt brass frame with crystal flowers & beads, 1970`s ca, German.This light has been thoroughly cleaned respecting the vintage patina. It is newly rewired & earthed with gold silk cable and a new black plug. It has been PAT tested and is ready to use. This lamp is compatible with other countries although it may be necessary to purchase different light bulbs suitable to local electricity. It is possible to use this lamp with a dimmer switch on the wall. Light bulbs included. Palwa is well known for its super quality items which combine Modernist lines with luxury materials like gold plated gilt & crystal. 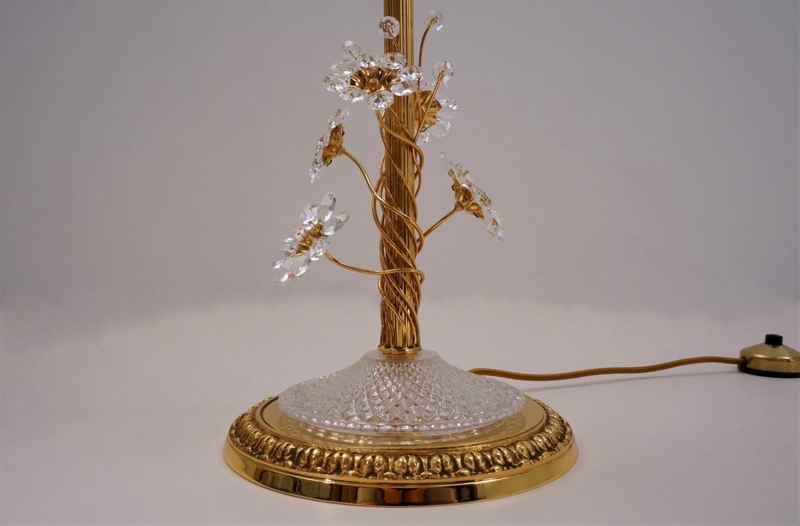 This lamp has that unique `fairy tale` touch of 30 crystal flowers, 9 crystal `buds` & dangling crystal beads. The unique combination of Modernism & Naturalism make this lamp a fun addition to a range of interiors such as Art Deco, Mid-Century Modern, Hollywood Regency, 70`s Glamour, Traditional or Contemporary. Structurally this vintage floor lamp is composed of the base with a central column leading to a traditional candelabra form of 5 arms. It is topped with a bouquet of crystal flowers. The solid brass frame is gold plated gilt. The central column is fluted with a polished finish. There are 25 removable flowers distributed along the frame: 10 big, 10 medium & 5 small. Each flower is made up of 8 octagonal crystals as the `petals`. The center of the flower is in gilt brass, finished with a golden nut cap securing the flower in place. Unscrewing this bolt allows the flower to be removed. At the top of the column there is a central cup decorated with tiny crystal beads covering the junction of the 5 main arms. This cup has a ring & screw to allow access to the cables inside. 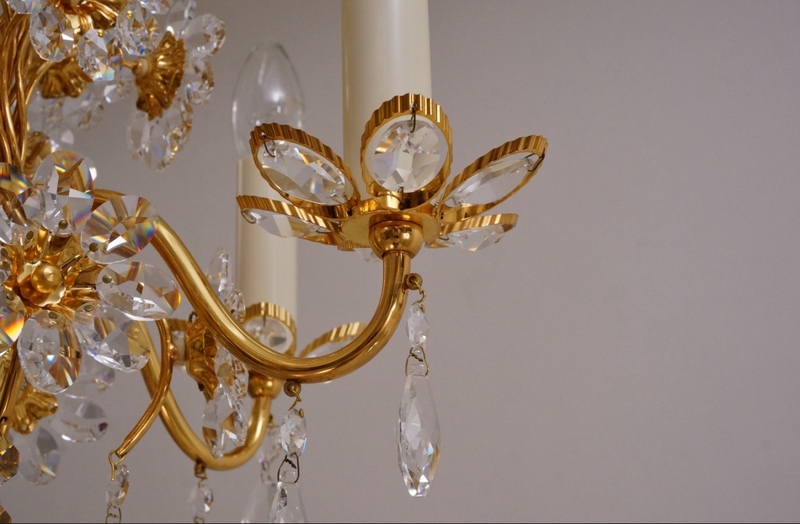 Each main arm curves upwards and is finished with a lamp holder with a removable candle shaped cover. Carries 5 standard (E14) small screw light bulbs up to 40 Watts each. At present fitted & photographed with Candle clear 25 Watts light bulbs which are included in the price. 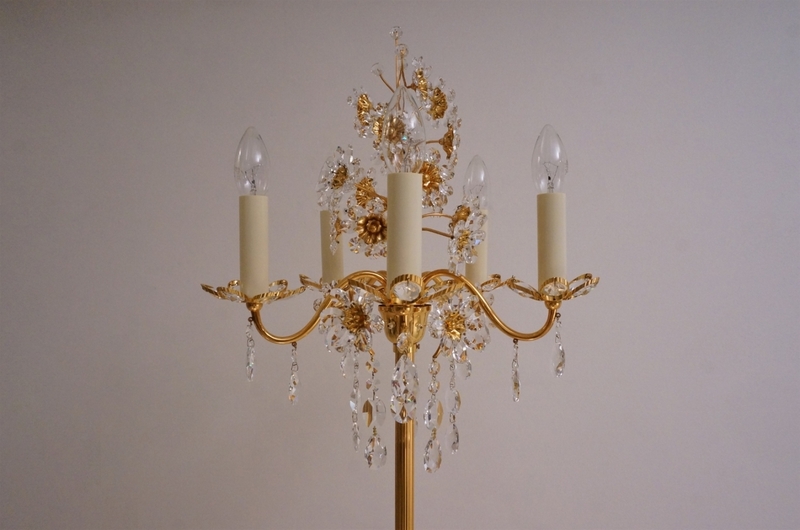 Under each lamp holder there is a flower shaped bobeche. These flowers complement the overall design but are different from the rest. Each is made of 6 petals composed of faceted oblong crystals inside a textured brass gilt frame. 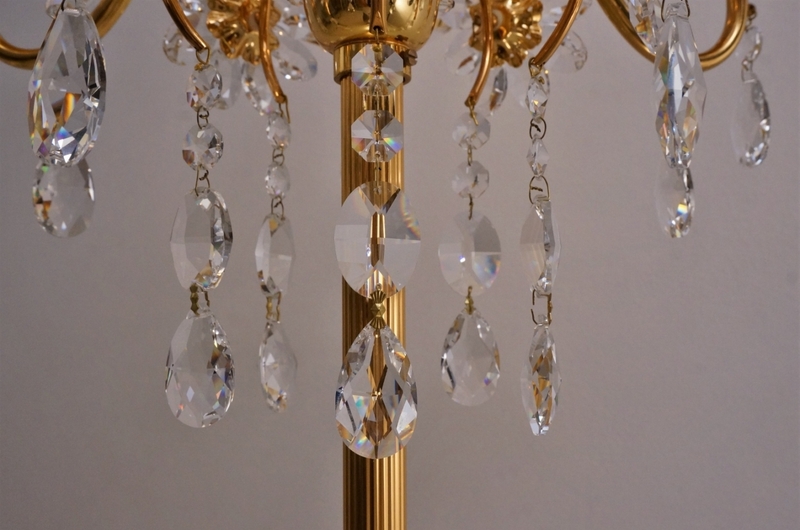 Along each main arm dangle two sets of faceted crystals. In between each arm, there are 5 thinner stems curving downwards. 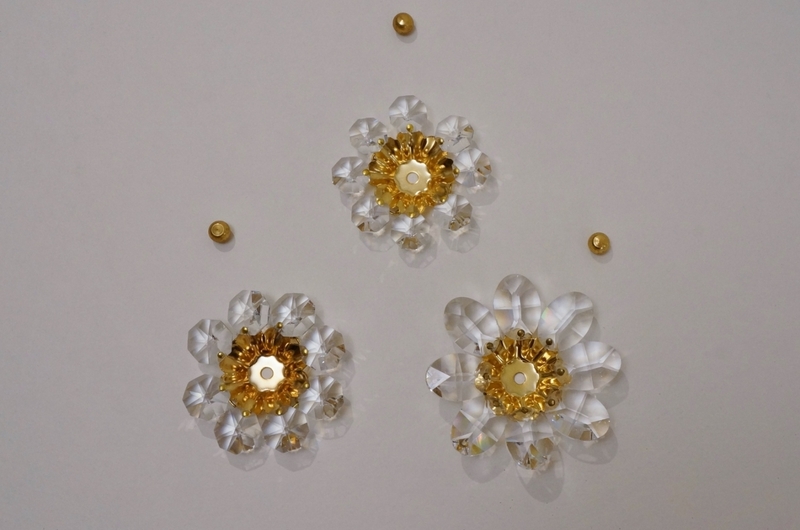 These are decorated with a flower in the middle, and finishing with dangling crystals. 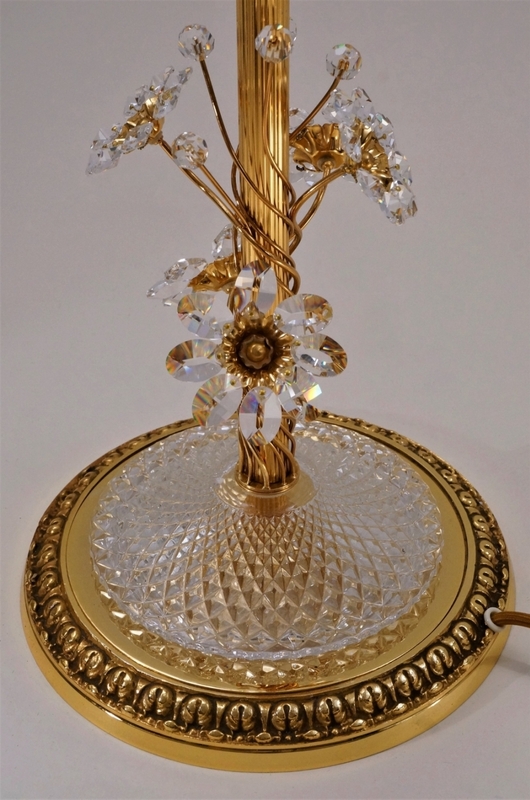 A bouquet of flowers finishes this lamp at the top. 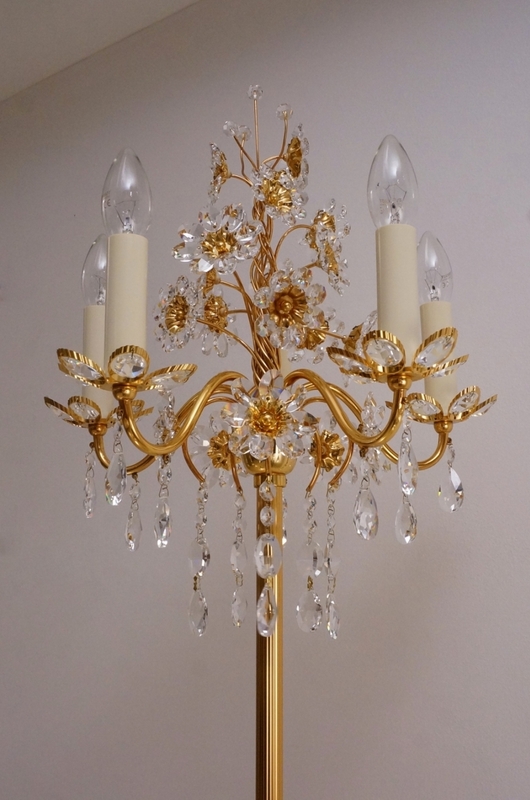 This is made up of 15 brass stems each with a flower and 4 stems with a faceted crystal bead. The round base is also gilt brass. It has a scrolling trim in which sits a faceted glass cover. From the centre rise 5 flowers & 5 stems with beads. 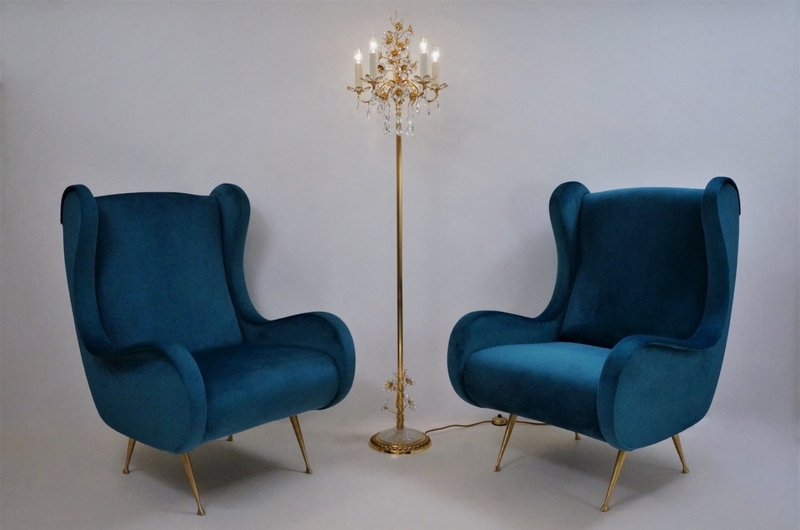 This vintage floor lamp is in very good condition. All the flowers are present with all the crystals in place. 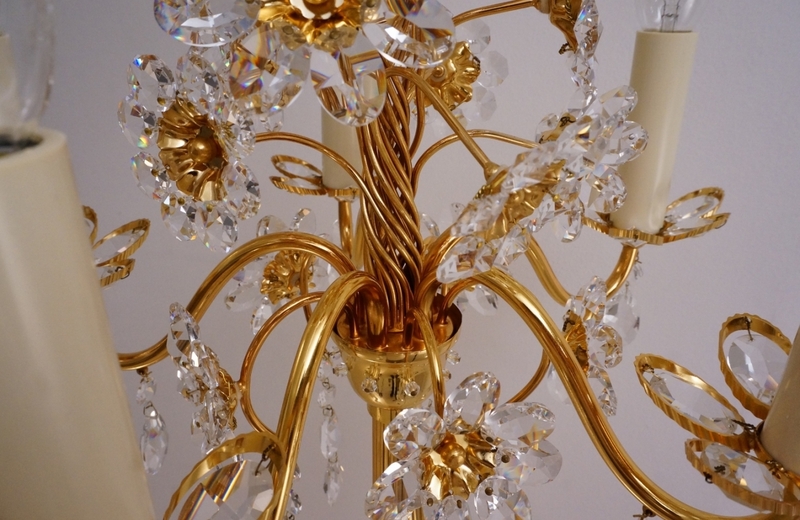 There are no chips or cracks on the crystals and only a light patina in line with age. The crystal on the base is in very good condition with no cracks or chips. The gilt finish on the brass is all present and in very good condition with a warm antique patina. Packing is offered free of charge. We take special professional care while packing. For safe transport the flowers would be removed & wrapped individually. The rest of the frame would be bubble wrapped with an outer layer of card & foam and placed in a box, ideal for safe shipping. Additional Dimensions: The round base has a diameter of 23 cm.PALWA LIGHTING HISTORYPalwa is a prestigious lighting company from Germany that after nearly 80 years still exists today. Palwa has a historical worldwide reputation as a manufacturer of beautiful light fittings with their own in-house design department and craftsmen who produce special one-off designs. For this reason their vintage pieces are becoming very rare to find and sought after.